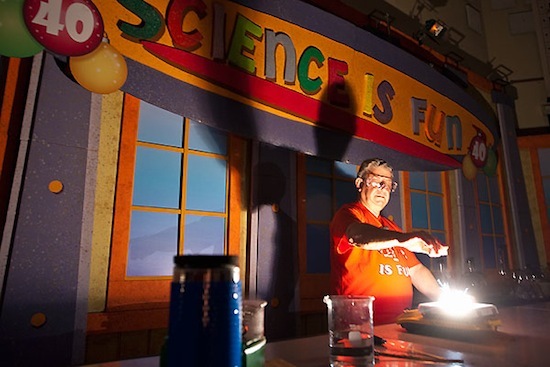 Bassam Shakhashiri performs during his annual “Once Upon a Christmas Cheery In the Lab of Shakhashiri” chemistry demonstration program in 2009. Bassam Shakhashiri, a chemistry professor and William T. Evjue Distinguished Chair for the Wisconsin Idea at the University of Wisconsin–Madison, has received the 2013 Carl Sagan Award for Public Understanding of Science. Named for the astronomer whose enthusiasm and broad scientific knowledge helped inspire a generation to look at science as a fascinating discipline that makes a different in the real world, the Sagan Award was made by the Council of Scientific Society Presidents. The leaders of 60 societies with more than 1.4 million members comprise the council. Shakhashiri is the immediate past president of the American Chemical Society, the world’s largest scientific society. Long known for his standing-room-only Christmas chemistry demonstrations, his recent efforts include the American Chemical Society Climate Science Toolkit, which encourages scientists to communicate the objective scientific facts about climate change.